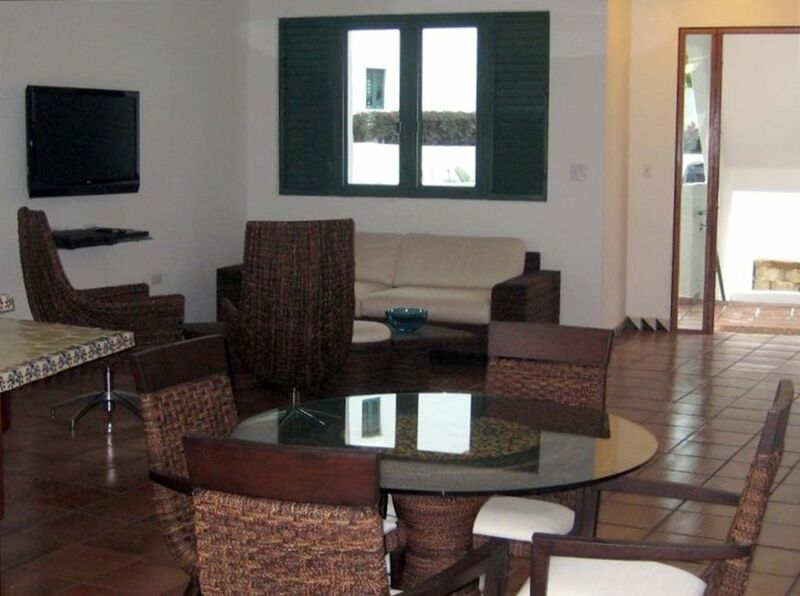 Come enjoy and relax in our modern villa located at the renowned Wyndham Rio Mar Resort. With beautiful furniture, our spacious villa provides an excellent choice for your next business or vacation trip. Experience the comfort of having everything in one place: beautiful beaches, breathtaking views and resort amenities, but with the privacy of staying in your own apartment at a residential community. Our master bedroom has a queen-size bed, Plasma TV, DVD, CD player and bathroom. The Second bedroom has a full plus two twin-size bunk bed, plasma TV, VCR, DVD player. A Fully equipped spacious kitchen with stainless steel appliances, including a built-in wine cooler and dining area. Washer and dryer in the unit. The hotel has two championship golf courses (Ocean Golf Course and River Golf Course), clay and hard court tennis facilities, and also offers activities such as jet skiing, kite surfing, windsurfing and snorkeling. Also, horseback and four-track riding activities on the nearby areas. Resort has 12 restaurants and lounges, bars and casino. Gazebo, pool and Jacuzzi are only steps away. No passport is required if you are a US citizen. Free Internet access 'WiFi' provided. Playground for kids within the premises. This is our family and we are happy that you are interested in renting our property. My husband is a Business Administrator and I am a Civil Engineer and we have two handsome boys. We enjoy staying at our Rio Mar Resort Villa because it makes us feel away and at home at the same time. We chose to buy a vacation rental in this location because it is only thirty minutes away from home and from the airport. Also, having an apartment inside a Resort gives us the flexibility of staying in and cook dinner or going to eat at one of the hotel restaurants. In addition, our villa has the most beautiful views to the mountains, the golf course and the ocean. Some of the unique befenits we enjoy while staying at our property are the many activities that we can choose from such us swimming, going to the beach, playing golf or tennis and so many others. Also, there are different attractions nearby like the El Yunque National Rainforest or the Fajardo Luminiscent Bay. Many amenities of the Windham Rio Mar Hotel can be used, such as pools, casino, spa, tennis courts, golf course, etc. We greatly enjoyed our stay here... perfect location for family with teens to explore El Yunque, and islands to east, yet still be close to San Juan. Spent many days just enjoying the beach, tennis, pool, and other Rio Mar resort amenities. Golf Cart and VIP passes to resort pools are huge plus. Angela was an incredibly gracious and accommodating host, handling our last minute reservation as we had to move from other lodging during our vacation. This villa is wonderfully equipped, clean, and comfortable..... made our vacation to beautiful Puerto Rico a wonderful escape. Thank you Angela!! I had a lovely stay. No trace of hurricane damage, everything pristine. Angela is a very generous host - she let me stay till late afternoon on my last day even though she had other tenants inquiring about the property. She provides a golf cart but I never used it as I preferred to walk around the beautiful resort. Great stay. Thanks Angela! Spacious well maintained villa with spectacular views of the sea. The beach club is a 5 minute drive, the beach is clean and beautiful. Great location, 30 minutes to San Juan and Fajardo, 10 minutes to the rainforest. You won't be disappointed staying in this secure and beautiful resort. The stay was amazing. Everybody we talked to outside and inside the villa area was very friendly. Great property location and beautiful resort. Outstanding View! The property is very nice and there is plenty provided to support a large family if necessary. It was nice having a large kitchen and washer during the stay. Having guests visit can be a bit challenging since there are so many secured gates but I assume that doesn't matter to most. I would definitely stay again. Thanks.